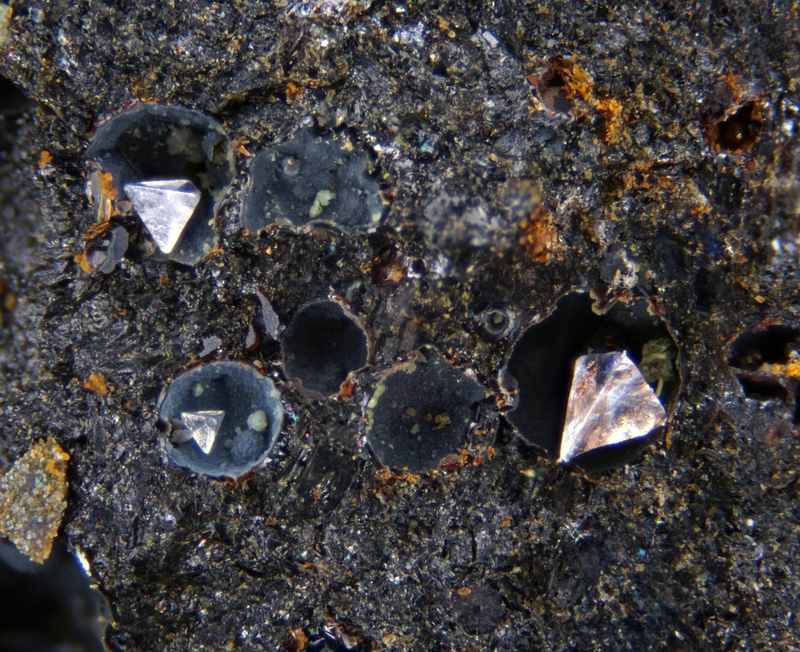 Nantokite: Mineral information, data and localities. For the locality at Nantoko, Copiapó, Chile. 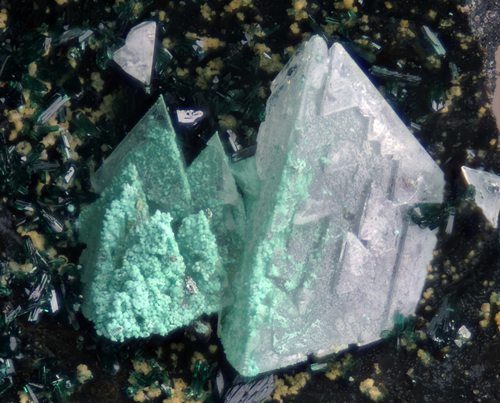 A rare anhydrous copper chloride, known only from arid environments and slags (as tetrahedral crystals). Colourless and transparent when fresh. 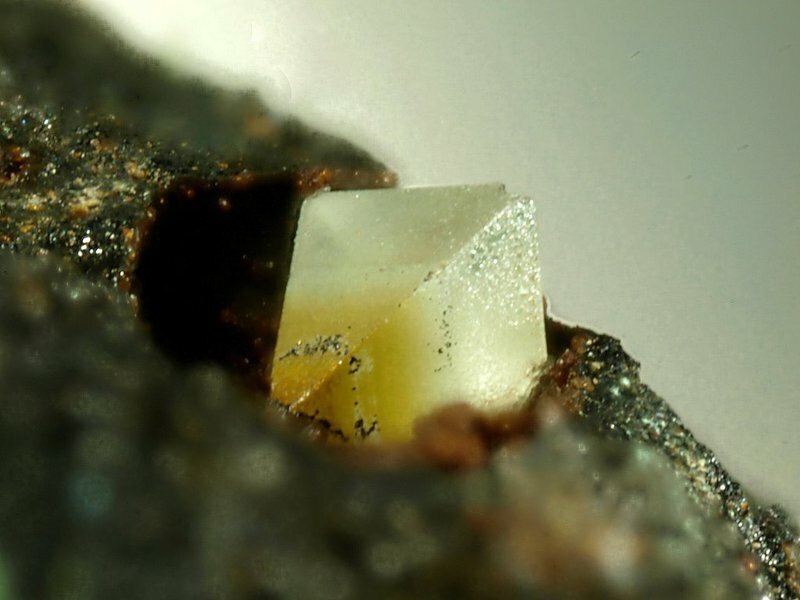 Alters superficially to "paratacamite" (or rather "clinoatacamite"?) when exposed in air. A : M:X = 1:1, 2:3, 3:5, etc. Massive, granular; small white tetrahedra. Malachite 1 photo of Nantokite associated with Malachite on mindat.org. Cuprite 1 photo of Nantokite associated with Cuprite on mindat.org. Atacamite 1 photo of Nantokite associated with Atacamite on mindat.org. 8.2.8 Calumetite Cu(OH,Cl)2 · 2H2O Orth. Unstable in humid air, and transforms slowly into greenish secondary Cu-hydroxchlorides. Alters to "paratacamite" on exposure. Breithaupt, J.F.A. (1868) Nantokit, ein neues Mineral. Berg- und Hüttenmännische Zeitung: 27: 3-3. Breithaupt, J.F.A. (1872) Mineralogische Notizen. Nantokit. Neues Jahrbuch für Mineralogie, Geologie und Paläontologie: 1872: 814-820. Armstrong and Carmichael (1894) Proceedings of the Royal Society of New South Wales: 28: 96. Wyckoff and Posnjak (1922) Journal of the American Chemical Society: 44: 30. Barth and Lunde (1925) Norsk Geol. Tidsskr. : 8: 281. Palache, C., Berman, H., Frondel, C. (1951) The System of Mineralogy of James Dwight Dana and Edward Salisbury Dana Yale University 1837-1892, Seventh edition, Volume II: 18-19. Pfitzner, A., Lutz, H.D. (1993) The systems CuCl-MIICl2 (M=Mn, Cd) - crystal structures of Cu2MnCl4 and γ-CuCl. Zeitschrift für Kristallographie: 205: 165-175. Dana 6 (1892): 154; Palache, Charles, Harry Berman & Clifford Frondel (1951), The System of Mineralogy of James Dwight Dana and Edward Salisbury Dana Yale University 1837-1892, Volume II, John Wiley and Sons, Inc., New York, 7th edition, revised and enlarged, 1124 pp. : 18. Yi, L., Gu, X., Lu, A., Li, X., Zhang, D., Wang, Z., ... & Zuo, H. (2017). Atacamite and nantokite in Kaerqueka copper deposit of Qimantag area: Evidence for Cenozoic climate evolution of the Qaidam Basin. Journal of Earth Science, 28(3), 492-499. Coppola, V., Boni, M., Gilg, A., and Strzelska-Smakowska, B. (2009): Mineralium Deposita 44, 559-580. Anthony, J.W., et al (1995), Mineralogy of Arizona, 3rd.ed. : 310; Graeme, R. (1993), Bisbee revisited, Min.Rec. : 24: 421-436. Anthony, J.W., et al (1995), Mineralogy of Arizona, 3rd.ed. : 398; Graeme, R. (1993), Bisbee revisited, Min.Rec. : 24: 421-436. Henderson, William, A., Jr. (1967), A Copper Analog of Laurium, Greece. Rocks & Minerals: 42(5): 273-276.